Home Digestive System How Is Gas and Heart Palpitations Related? It is common to get gas after eating, but there are some people that experience heart palpitations too. This can be concerning, but most often benign depending on the cause of the heart palpitations. Gas is normally caused by taking in air when you eat gas causing foods, carbonated sodas, or eating too fast. On the other hand, heart palpitations may or may not be associated with eating and should be checked by your doctor if you have never experienced this before. 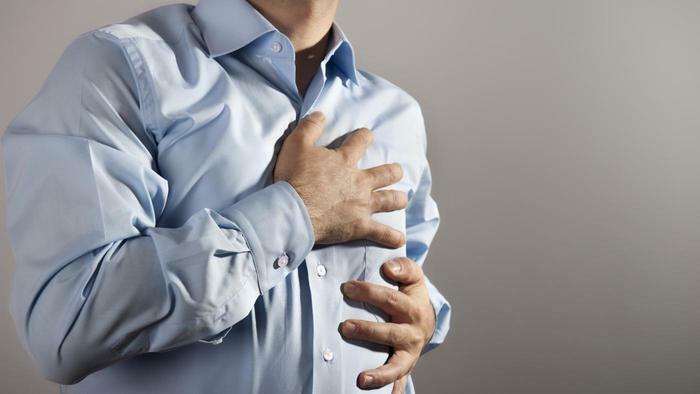 Can Gas Cause Heart Palpitations? Yes, gas and heart palpitations are related in some way. Excess air in the digestive tract can put pressure on the heart and cause it to skip beats. You have a nerve that lies just inside your upper gastrointestinal tract. When triggered, it can cause dizziness, fainting, or heart palpitations. It is known as the "vagus nerve." Many things can trigger the nerve, including sneezing, coughing, bearing down, and pressure from gas. It may also just be a normal reaction from less blood flow to the heart. This is nothing to worry about if you’re healthy and it usually resolves once your food is digested and has entered the intestines. If you have a heart condition, your doctor will let you know if it can cause a problem and how to keep from getting too much gas. Why Are You Experiencing Gas and Heart Palpitations? If you eat foods that produce too much gas then you may feel heart flutters from air pressure in your stomach. Some of the gas inducing foods include soda, foods with fiber (beans, cabbage, onions), and high sugar foods. If you eat too fast you may swallow too much air. This can cause your stomach to bloat and put pressure on your heart. This can also happen when you chew gum and swallow often. Helicobacter pylori are bacteria that can invade the lining of the stomach. It may cause acid and gas buildup that may lead to heart palpitations. If the pancreas does not release enough enzymes the digestion process slows down. This can cause excess gas that leads to bloating and heart palpitations. If you eat food that contains bacteria or parasites, you may get food poisoning. Not only does this cause vomiting and/or diarrhea, it may also cause gas and heart palpitations. With this, your body cannot properly digest fructose and carbohydrates. It causes a gas buildup in your intestines that can lead to pressure on the upper abdomen and cause heart palpitations. If food moves slowly through your digestive tract then gas may get trapped in the stomach area. People with anorexia, stomach muscle issues, and gastroparesis usually suffer from this. If you have celiac disease or gluten sensitivity, eating wheat and foods containing high amounts of gluten can cause not only gas, but an immune system reaction in your body. Your heart may react to the intolerance with irregular heartbeats and palpitations. Eat Slowly. Eating slowly will help prevent you from swallowing too much air when you eat. This will also help prevent you from becoming overfull, causing pressure on your vagus nerve. Chew Food Well. You need to chew your food well to help get digestive enzymes into the food before it goes into your stomach. This will help cut down on gas buildup and bloating. Take Ginger. If you have chronic problems digesting, try taking 550 mg of ginger with each meal. Ginger helps calm down the vagus nerve and aids in digestion. You can also try some simple digestive enzymes made from natural papaya. Burp. If you have excess gas in your stomach, try burping before you get overfilled with air. You can also use an anti-gas medicine called simethicone. Take Probiotics. Taking probiotics can help put the "good bacteria" back in your digestive system. Not having enough of this helpful flora can create improper digestion and excess gas. While most heart palpitations are nothing to worry about, some may provoke or be caused by abnormal heart rhythm issues. In some cases, early cardiac disease can cause heart palpitations after eating due to decreased blood flow to the heart. When you eat a large meal, your body diverts blood flow from your brain and heart. This helps the process of digestion and in healthy people it's not dangerous. If you have blockage to the heart, this can seriously lower the oxygen levels to your heart. A commonly known fact is the highest time of year for heart attacks is after Thanksgiving dinner. If you do not have excessive gas and pressure after a meal and you have heart palpitations, this could indicate a strain on your heart. Also, if you feel pressure in your chest area, this could also be mistaken for gas and actually be your heart feeling strain from a large meal. Aside from meal times, if you are suffering from heart palpitations more often than just after you eat you really should see a doctor. Most often they can be caused by simple things like anxiety, exhaustion, dehydration, and emotional stress. However, if you have other physical symptoms that cannot be explained, see your doctor for an evaluation. If you have anything like chest pain, shortness of breath, dizziness, and/or racing heart you should get it checked out immediately.